High Quality Content by WIKIPEDIA articles! 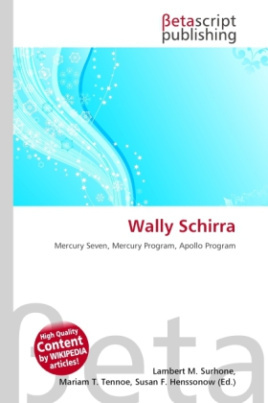 Walter Marty Schirra, Jr. (March 12, 1923 May 3, 2007) was one of the original Mercury 7 astronauts chosen for the Project Mercury, America's first effort to put humans in space. He was the only person to fly in all of America's first three space programs (Mercury, Gemini and Apollo). He logged a total of 295 hours and 15 minutes in space. Schirra was the 5th American and the 9th human to ride a rocket into space. Schirra was born into an aviation family in Hackensack, New Jersey. Schirra's father, Walter M. Schirra, Sr., went to Canada during World War I and earned his pilot rating. He later became a barnstormer. Schirra's mother, Florence Leach Schirra, went along on her husband's barnstorming tours and performed wing walking stunts. By the time he was 15, Wally was flying his father's airplane.